Our citizen legislators have lots of choices to make when they meet for the annual legislative session every January – how to prioritize spending on public services like education, health care and public safety, which laws to enact, and whether to make changes to our state’s tax code. With a new Governor on the fourth floor, legislators have new possibilities in the coming session. They can choose either to continue tax cuts that benefit the wealthy and well-connected (but not the economy), or to prioritize our children and hard-working families. In short, they can – and should – reverse course on excessive tax breaks and invest in healthy and thriving communities instead by making: investments in our schools to set our children on a path to success; investments in health care to keep people healthy and working; and investments in infrastructure – roads, bridges, and modern technology – that will benefit our families and businesses. But in order to support these foundations for a thriving community, New Mexico needs dependable revenues that are equitable, sustainable, and adequate. Our current revenue stream fails to meet these principles because our tax system is: most reliant on those with the least incomes, over-reliant on the volatile oil and gas industries, and fails to raise enough revenue to meet the educational needs of our children, particularly those of color. Under the current personal income tax rate structure, families earning $25,000 per year are paying the same marginal tax rate as families earning $250,000 per year, despite having a very different ability to pay. We can reestablish fairness in the personal income tax by increasing the top tax rate on a relatively small number of individuals – those who are in the best position to afford it. This restructuring would strengthen our revenues, create a more equitable tax system, and reduce our reliance on volatile oil prices. This issue of fairness is apparent when looking at the combination of state and local taxes we all pay. 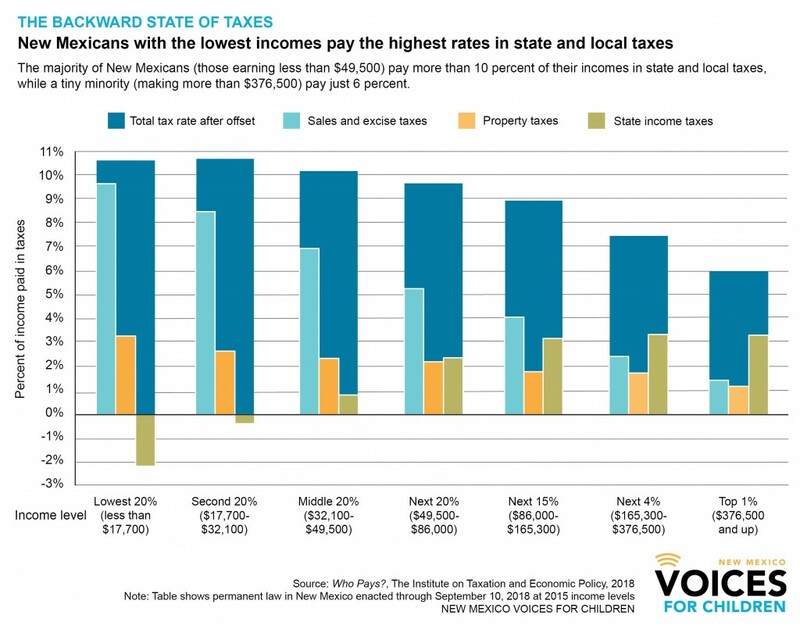 Largely because of our sales taxes, New Mexico’s tax system falls hardest on low- and middle-income families who pay a greater share of their incomes in state and local taxes than do high-income households. As Figure I shows, New Mexicans earning the lowest incomes pay nearly 11 percent of their income in taxes while the wealthiest pay only 6 percent of their income in state and local taxes. This tax system actually exacerbates income inequality in our state. A more progressive personal income tax rate structure would help address this issue because the personal income tax is the only tax that can be based on the ability to pay. A more progressive rate structure also helps reduce racial inequities. The median net worth of non-Hispanic white households in New Mexico is nearly ten times that of households of color. This is especially concerning in a state where people of color make up the majority of the population. This “racial wealth gap” is the result of discriminatory policies and systems that have been implemented throughout history. And because wealth accumulates over generations, the divide has only gotten worse over time, creating patterns of poverty and wealth that are highly unequal along the lines of race and ethnicity. Increasing the income tax on the state’s highest earners would help advance racial equity in New Mexico. There are several other ways we can use tax reform to create a more equitable society for all New Mexicans. First, we can repeal the capital gains income deduction that overwhelmingly benefits the wealthiest. It’s an ineffective give-away that does nothing for our economy. Second, the Low-Income Comprehensive Tax Rebate (LICTR) can also help reduce the regressivity of our state and local taxes. Unfortunately, it hasn’t been updated in 20 years to account for inflation, and has therefore lost a lot of its value. It is due for an increase. And finally, enacting a new Child Tax Credit and doubling the current Working Families Tax Credit would help mitigate the higher state taxes hard-working families will pay due to federal tax changes. These credits would return more than $100 million to these families, improve economic equity for families of color and women, and benefit 500,000 New Mexico kids. These proposals would give our hard-working families the resources they need to build a stronger New Mexico and secure a brighter future for our state. I hope our legislators make the right choice this year and choose to put our children and hard-working families ahead of the wealthy and well-connected. 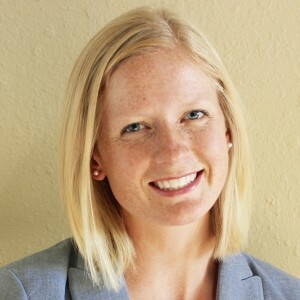 Paige Knight is a research and policy analyst with NM Voices for Children.